Over the centuries, some researchers say, there's a tremendous amount of solid evidence that the structure found on Mount Ararat in Eastern Turkey is the legendary Ark of Noah. At the same time, some others don't believe the evidence even though most people around the world believe the Noah's history and the incident is true. 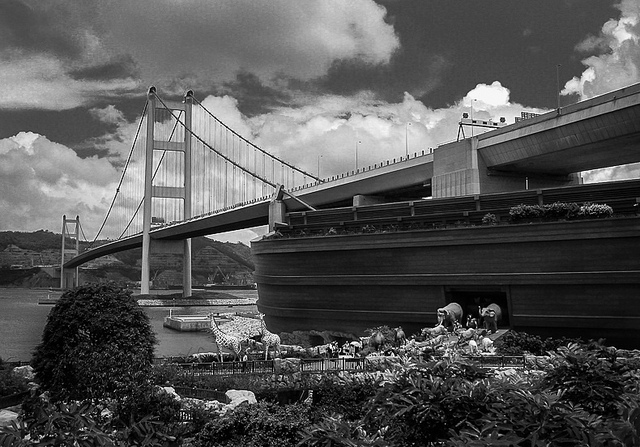 However, Hong Kong came up with an idea that build the Noah's Ark on the Ma Wan Island under the Tsing Ma Bridge and it was opened to the public in 2009. Now the Noah's Ark Hong Kong is one of the tourist attractions in Hong Kong. If you would like to visit to the Noah's Ark Hong Kong Resort, you can take ferries from either Central or Tsuen Wan. You can take bus from Tsing Yi MTR Station, Route No: NR330; from Kwai Fong Metroplaza, Route No: from Tsuen Wan MTR Station, Route No: NR331; from Tsuen Wan West MTR Station, Route No: NR331S; from Airport Terminal 2, Route No: NR334 . Also you can take taxi to the island, There is no MTR. The Ma Wan Island is a very tiny island which area is less than one square kilometre, but there are many nice and great places to see and take photographs. For more information, please click on their official site. We hope you have a nice trip!